Drive from Bergen to Voss and continue along Hwy. 13 towards Granvin. 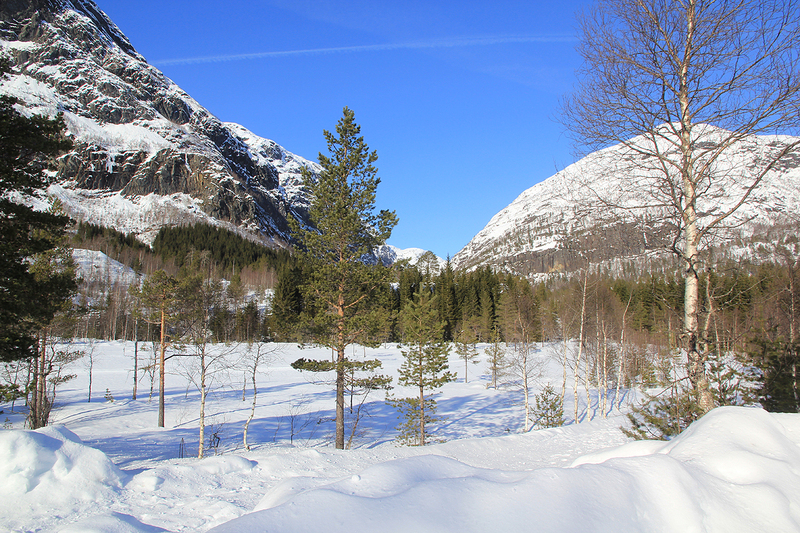 After exiting the long tunnel, drive around the north side of lake Granvinsvatnet, then look for Hwy. 572 forking left, the sign says Espeland. Measure from here. Drive 16.4 kilometer and locate a small road going left. Take this road, in winter the road ends at kilometer 16.9. Park here, this is the trailhead, location N60.59416, E006.87293, elevation about 315 meter. Continue along the road and cross the creek on a bridge. Immediately after this bridge, a sign saying Mjølfjell points left. This route runs up (or into) the very narrow Tyssedalen. Take this route. Continue on the right hand side of the creek, pretty soon I found it most easy to ski on top of the frozen creek. This works well until a slightly steeper section where one may ski up the small hill on the left side. Well across this small hill, the terrain opens up and runs quite flat to the innermost part of the valley. Locate what may look like a bridge, but seems to be some sort of old dam. Ski up near its right side and continue ascending to a small plateau higher up. Continue a climbing traverse further into the valley, you will cross a small valley that clearly holds a creek. 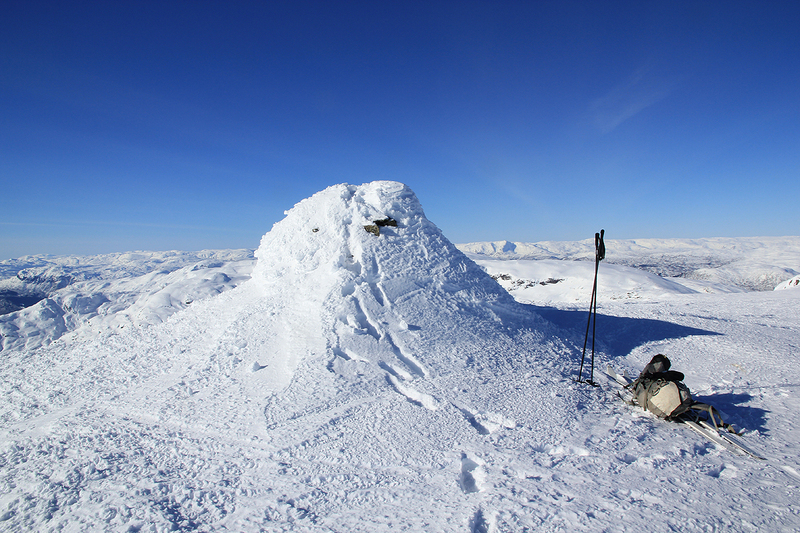 As you get higher, on a fairly large slope, turn back right and ascend to a more level area above a small ridge. The terrain looks a bit nasty here, but it is actually better than it looks. There are cliffs further left, but a skiing route can be followed by going more or less straight uphill with some steeper terrain above on your left. Again, the route follows a small drainage and now gains the large, flat area named Storebotnen on the map (south of lake 620). 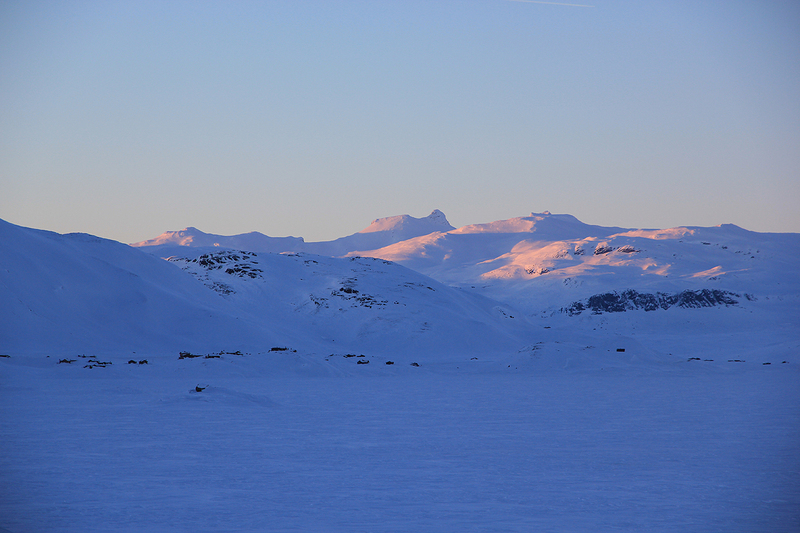 From Storebotnen, it is nice terrain and good skiing south towards Tyssedalsnuten. One can stay in the main valley or a bit further right and aim for a small, local col, location N60.61144, E006.89761, elevation about 1045 meter. Now, ski north of the next hump and into the highest part of col Hyrnaskar. 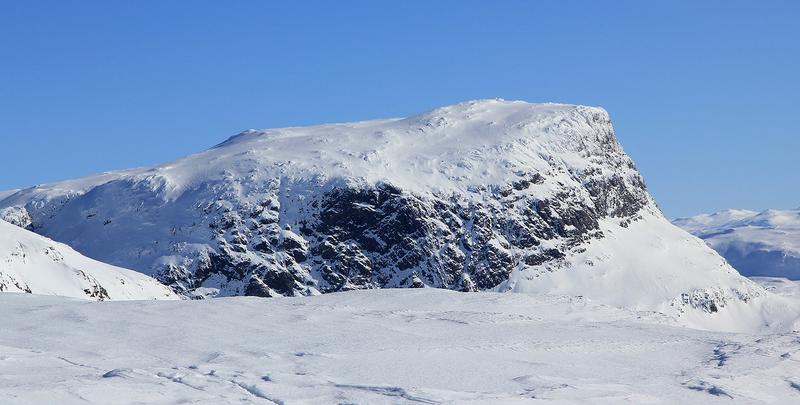 If the mountain has a hard (icy) crust, then the next, short ascent may be tricky (require crampons? ), my guess is that the skiing up here is OK most of the time. One may possibly avoid this steeper section by descending a bit north from Hyrnaskar, then picking a route back up again. From here, one can follow the broad ridge that runs towards the summit, staying a bit north (left) around 1200 meter elevation in order to avoid steeper terrain. There are many good slopes for skiing on this, final stretch. I had a nice invitation to celebrate Per Ove Oppedal's 40th. birthday at Fondsbu this weekend. Thus, I needed to catch a snowcat transport from lake Tyin booked for 1800 on Friday. This is about a 4 hour drive from Bergen and with an excellent forecast, I decided to just start early and make a good skitrip along the way. 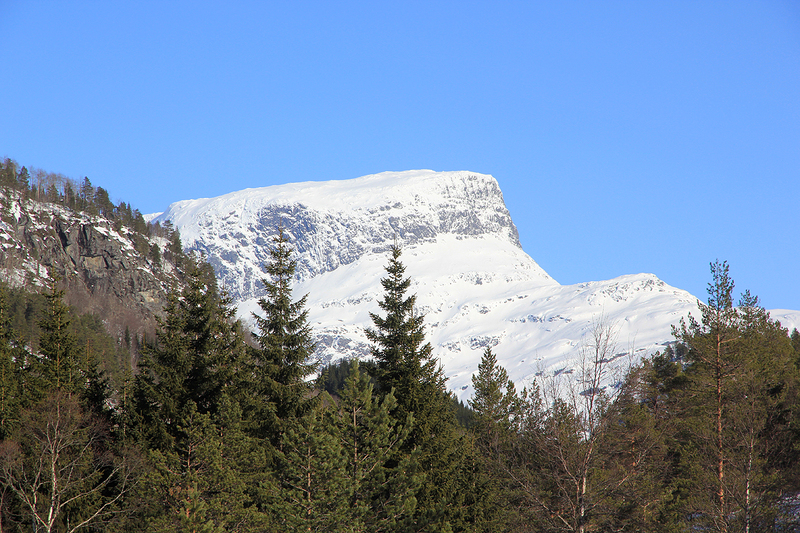 My choice fell on Skorafjellet, ascending it from near Ulvik. I left Bergen around 0500 and parked at the trailhead by 0730. This early in the morning isa good time to observe wildlife close to farms and roads. These animals are out of sight during the day, but they like to look for food near the locals farms early in the morning. 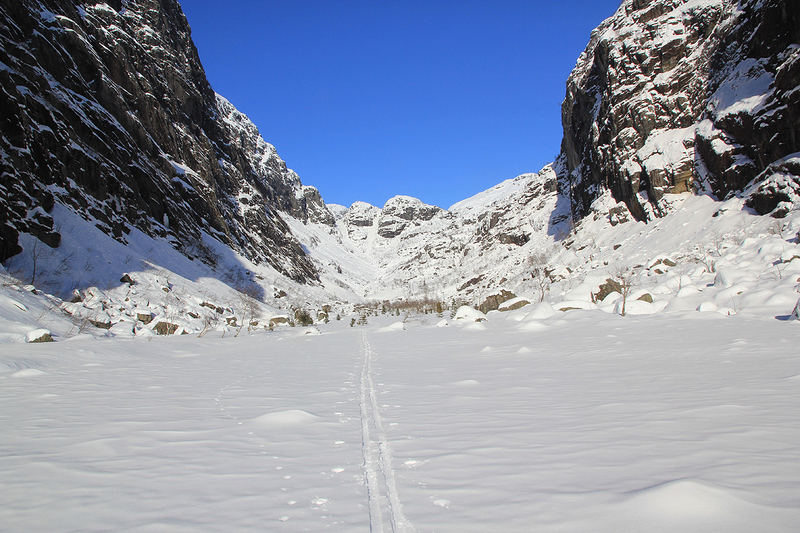 Leaving at 0740, I had a most interesting route finding trip in the narrow valley Tyssedalen and up to Storebotnen. 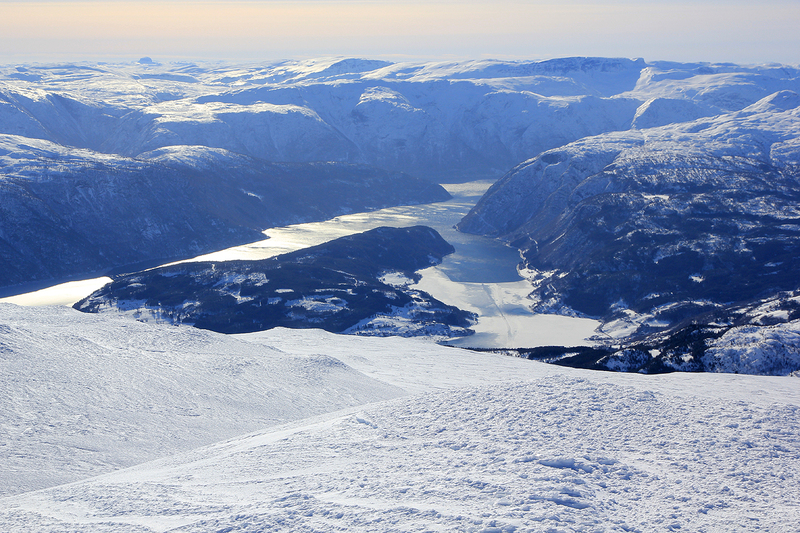 Higher up, but a bit before reaching the summit, one has a very impressive view of Vassfjøra. Skiing was good and I arrived at the summit around 1200 - noon. A very nice viewpoint, one can see Hårteigen and Hardangerjøklen, but also a very scenic look down to the fjord serving Ulvik. After about 15 minutes with photography, I started back down and reached the car by 1430. 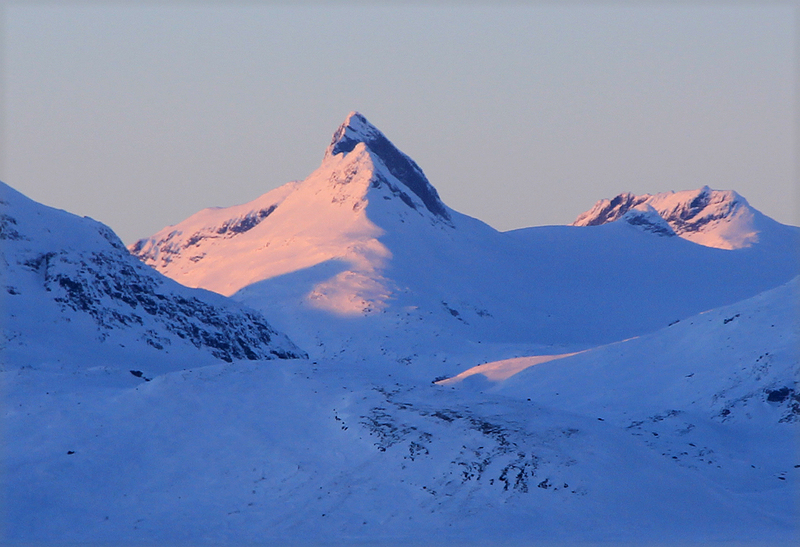 With ample time, I continued my drive to Tyin, arriving there just before sunset and seeing some nice colors on the Jotunheimen peaks, Uranostind is always a very good view. The next day i had good company as I ascended Galdeberget using my randonne-ski and Per Oves expert guidance to find some goood powder snow for the descent. 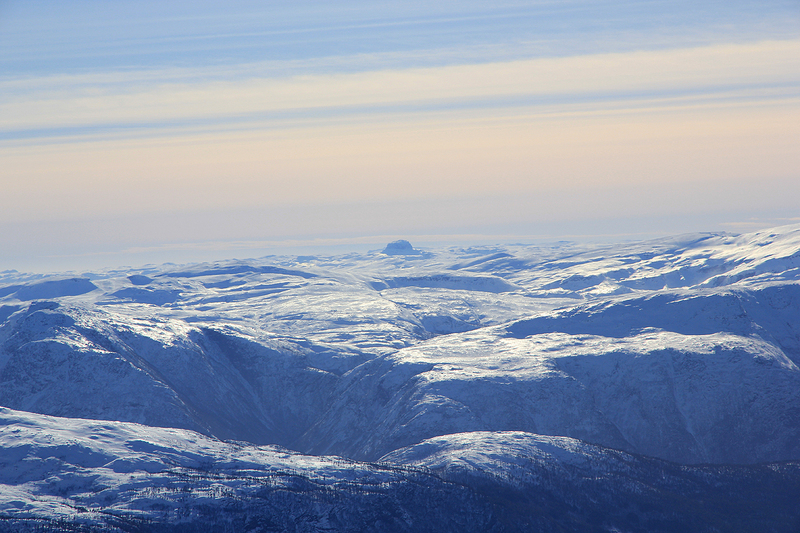 Skorafjellet as seen from near Tyssedalsnuten. Vassføra as seen from the trailhead. 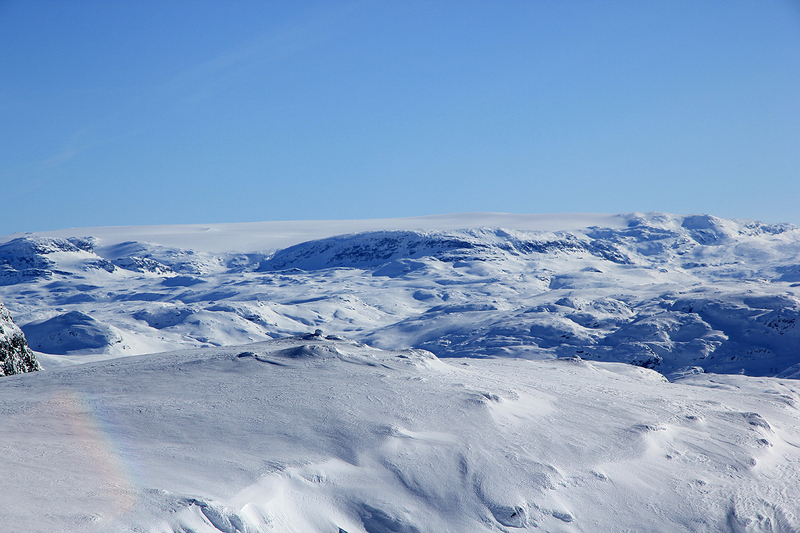 Dramatic landscape,/a> a look back from where I came - Tyssedalen below.